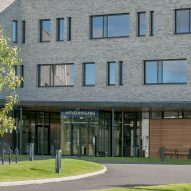 Patients of Hille Melbye's psychiatric centre in Oslo are welcomed by a decorative brick building, which is surrounded by landscaped courtyards designed to act as an extension of therapy. 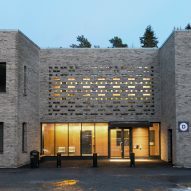 The local studio was commissioned to design the complex to accommodate day, night, outpatient and ambulatory psychiatric services for the neighbourhoods of Oslo. 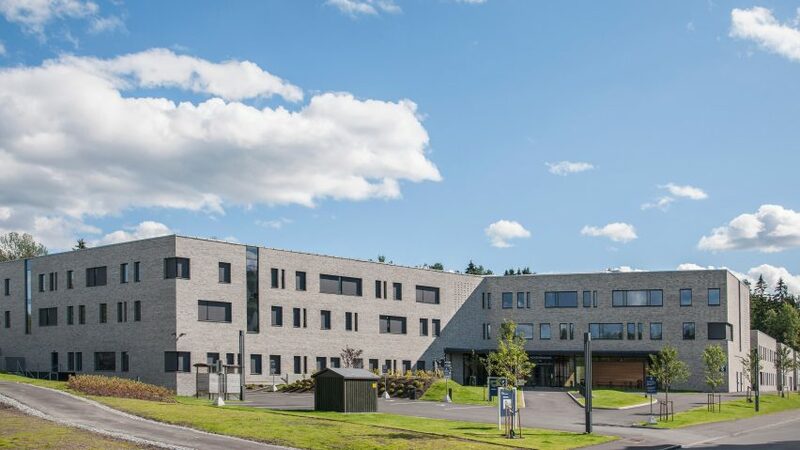 It was vital that the Southern Oslo District Psychiatric Centre could provide a safe environment for vulnerable patients, without compromising an inviting design and pleasant outdoor spaces for treatment. "One of the most important choices in the process was the choosing of site. What is good about this site is that building is a part of a small community. It's close to residential areas and shops and also very close to public transportation," the architects told Dezeen. "Then on the backside of the building you have a green area with trees, flowers and some animals, so it can also use the natural green environment as a part of treatment." Set back from Mortensrud square in the south of the capital, the project comprises two departments for accommodation and treatment, which are surrounded by gardens. 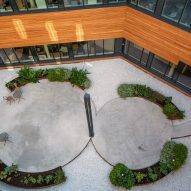 Landscaping was a priority for Hille Melbye, which wanted to ensure the first sight for patients entering the building was a garden. The architects felt this would immediately reduce the institutionalised feeling often associated with health centres. Courtyards also separate the accommodation, which is divided into three blocks each containing 10 bedrooms and a common space with a kitchen and living room. 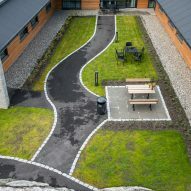 These gardens feature sheltered areas under an overhanging roof, creating a space for therapy as well as a place for patients to take a break on their own or as part of a group. "It's important that the patient can choose if they want to be together with the other patients or be alone in their room," said the architects. 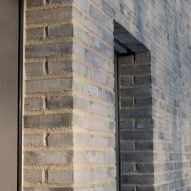 Each department is clad in grey brick – a preferred material throughout Hille Melbye's practice. Combined with a light mortar, this was chosen by the architects "to look solid, robust and safe", and also complement the mountain behind the building. 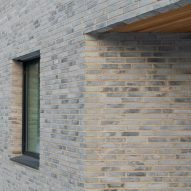 To introduce diversity and reduce its visual impact, the architects varied the transparency of the brick facade in a way that reflects the functions and required privacy of rooms inside. Additionally, generously sized windows and oiled oak are used around the entrance areas "to give a warm and humble feeling", and maintain the dialogue between the patients and the outside. The team focused on creating as little environmental impact as possible when designing the scheme. The treatment and administration building is arranged around a large open atrium that floods the main building with natural light, while also acting as a source of cross ventilation. The project was nominated for the Oslo city architecture prize in 2016. Health centres can often be a source of distress for patients, so like Hille Melbye, many architects seek to tackle this problem through their architectural design. Other projects aiming to reduce street include a cardiac rehabilitation centre that resembles a cultural centre rather than a medical facility, and an anxiety-reducing orthodontic clinic that features serene interiors and garden views. Photography is by Espen Grønli unless otherwise stated.